The stock market sell-off has made for a rough start to 2014 – and February could bring more of the same. February has historically been a tough month for the markets. It averages a negative 2.33% return. February ranks as the second-worst performing month of the year in the history of the Dow and S&P 500 (trailing only September, historically the worst month) and the fourth-weakest for the Nasdaq. But over the past 10 years – thanks to the near 20% market drop in early 2009 at the height of the financial crisis – February has provided the worst monthly market return. Data shows February market performances lag even worse when January returns are negative – which they were this year. Since 1971, the S&P 500 has declined 72% of the time in February when January returns were in the red. The Dow has been down 65% of the time under the same conditions, while the Nasdaq has been down 57% of the time. 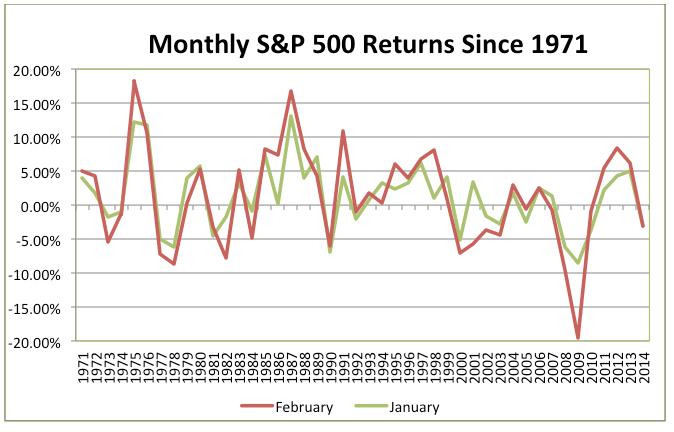 As the chart below shows, the returns in January and February have tracked in the same direction (both months positive, both months negative) in 30 of 43 years, or 70% of the time. The last time the S&P 500 bucked the negative January/negative February pattern was in 2010, when the S&P 500 fell 5.4% in January, only to reverse by more than 4.2% over the next 19 trading days. If the markets do take a beating in February as they did in January, investors should take note: Over the last 40 years, March and April have been two of the best-performing months, offering average returns of 1.15% and 1.56% respectively. And with February offering a big dip in good-performing months (January has provided an average 1.2% return in the last 40 years), this could provide investors with a historically strong buying opportunity. As Money Morning Chief Investment Strategist Keith Fitz-Gerald said Monday on FOX Business' "Varney & Co.," "Good companies, good products, and good earnings are never going out of style – if anything, they're going on sale."